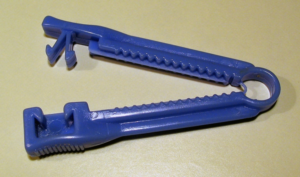 Below is what the usual umbilical cord clamp used by most South African Hospitals. This kind of umbilical cord clamp is quite big, clunky and sometimes can cause discomfort for the baby if it gets caught on the edge of a nappy. It’s no wonder that parents are interested in alternatives to the standard cord clamp – and yes, there are options! Humans are the only mammals on earth that have the umbilical cord immediately clamped and cut following the birth. Thankfully research is now available that shows that this unnatural practice actually causes harm and that delayed cord clamping should be standard practice. All other mammals leave it attached for quite some time, after which the mother would simply bite through it to separate the baby from the placenta. When this is done, the blood vessels in the cord go into spasm and close them off to prevent blood from passing through. The cord is also not sterile, and therefore anything placed on or near it should simply be clean and not sterile. So what are some options that can be used as an alternative to a big plastic clamp? Lotus birth is the practice of leaving both baby, cord and placenta as an intact unit. The cord is not clamped and the placenta is delivered without cutting the cord. Depending on the preferences of the parents, the cord may be cut in a few hours time, or left alone completely until the cord dries up and falls off naturally. You can read more information abou thow to have a Lotus Birth here. After leaving the cord to finish pulsating, the cord is clamped with artery forceps on the placenta side and the silk is tied around the cord on the baby’s side. The cord is then cut between these two “clamps”. You can either make or buy silk umbilical cord ties. While it’s safe enough to tie them on directly, you may wish to boil them prior to use. 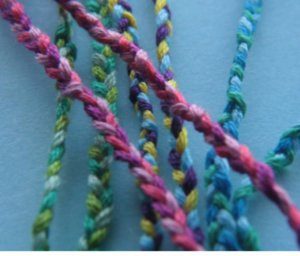 They make a lovely substitute which are pretty, colourful and can be kept as a keepsake. In this case the placenta needs to have already been delivered and placed in a container. Boards are placed between the baby and where the cord is to be severed. Using lit candles (and bowls to catch the wax) the mother, father and/or siblings burn through the umbilical cord. This can be done as part of a ceremony with prayers or blessings if you wish. There is no chance of infection with this method due to the fact that the end is cauterised so is a good option, but it does take some preparation and understanding to do.